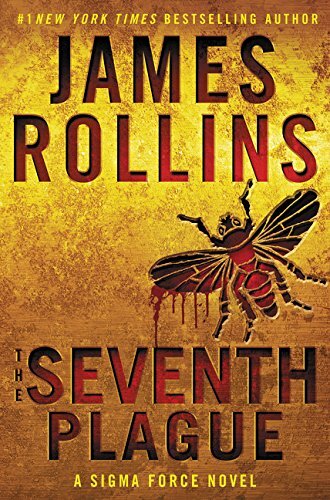 The Seventh Plague by James Rollins brings back the Sigma Force group, this time to save the world from a plague dating back to the biblical plagues of Egypt. The Seventh Plague brings the reader first into contact with an Egyptian woman who sacrifices her life, knowing that she carries the plague and its secrets. Moving forward several millennia to the mid 19th century, the crisis reappears with new players attempting to find a cure: Mark Twain, Nicola Tesla, and Henry Morton Stanley; enter David Livingstone as a background character. Introductions of these characters aside, the real story begins when Prof. Harold McCabe, a bio-archaeologist, stumbles out of Sudan after being mysteriously lost for two years. The professor does not survive, and his body is brought to London where an autopsy is to be performed. The professor’s disappearance two years earlier leaves many unanswered questions, especially if any of his team survived. His sudden and unexpected reappearance and subsequent death causes emotional stress to his coworkers, Safia al-Maaz and Derek Rankin, and his daughter, Jean McCabe. The autopsy goes awry right from the beginning, when an unusual microbe is discovered in the professor’s brain; his body had been self-mummified. Chaos ensues. Enter Sigma Force. Safia, watching the autopsy realizes something horrible is happening, and calls her friend, Painter Crowe, director of the covert Sigma Force. As she speaks to him through her computer and as he listens to her story, she confirms that she believes the professor died from exposure to an ancient plague. Suddenly, a muzzle flash shoots through the room, Safia is under attack, and the monitor goes black. Unexplained deaths begin to occur across different parts of the world, and Sigma Force goes active to find the cause and cure for this plague. Through a series of related clues left by Dr. McCabe, the group travels in two different directions to gather information. Kat Bryant and Painter Crowe follow the trail of clues to Ellesmere Island in Canada where they find Safia as well as Rory McCabe, the son of Professor Harold McCabe, and one of the lost expedition members. They fall into the clutches of billionaire Simon Hartnell whose goal is to harness the power of the virus to provide an unending source of electric power to the world. To accomplish this, he plans to “seed” the outer atmosphere with these electricity-eating microbes, regardless of the possible effects. But he needs Safia and Rory to decipher the hieroglyphics that were found with the mummy of the woman who died over 2000 years ago. In the meantime, the rest of the crew, Monk Kokkalis, Seichen, and Grayson Pierce, find themselves in England, tracking the location of Professor McCabe’s daughter, Jean, and Derek Rankin. And the race is on as the Sigma Force crew arrives just in time to save Jean and Derek from capture by an unknown force. Within this group is a woman trained by the “Guild,” the same group that originally trained Seichen as a killer. The two women play a cat and mouse game throughout the story, trading places as hunter and hunted. While Kat in Canada is able to remove Safia and Rory from capture, Painter is not as lucky and it is left to him to accomplish the impossible: stop Simon Hartnell before he accomplishes his goal. On the other side of the world, Grayson Pierce and his group follow the trail of clues left behind as they track a cure for the disease that is spreading across the world. Their chase takes them from England to Egypt to the Sudan, where they encounter the mysterious force that continues its attempt to kidnap Jean McCabe. Throughout the story Rollins plants tantalizing clues for both groups to follow. In typical Rollins style, he places his characters in impossible situations and extricates them just in the nick of time. It should be noted, however, that The Seventh Plague is not his best effort. In spite of his intriguing scenes, the first two-thirds of the book is at times confusing, the clues difficult to follow. His use of historical characters such as Mark Twain, Nicola Tesla, Henry Morton Stanley, and David Livingston is at times clever, at other times a stretch. Suffice to say, without giving away the ending that was both exciting and at times poignant, Rollins’ fans will take the book for its full value—another exciting Sigma Force adventure.